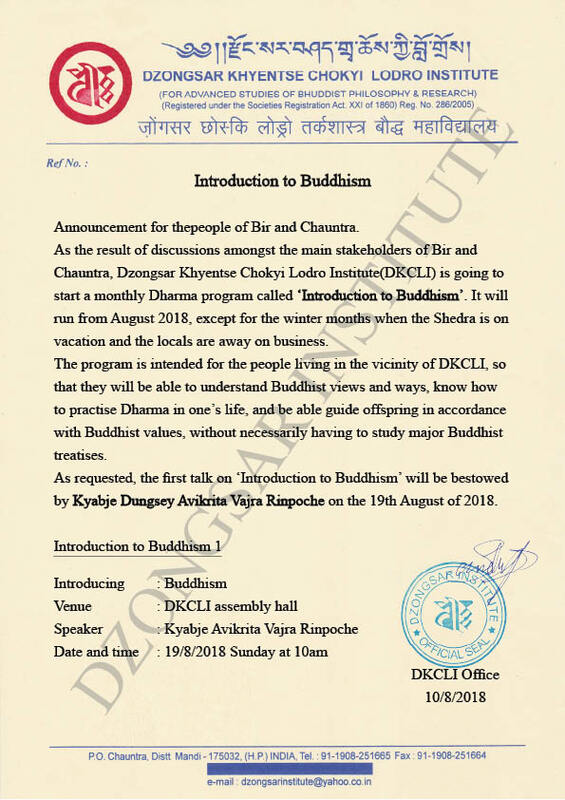 As the result of discussions amongst the main stakeholders of Bir and Chauntra, Dzongsar Khyentse Chokyi Lodro Institute(DKCLI) is going to start a monthly Dharma program called ‘Introduction to Buddhism’. It will run from August 2018, except for the winter months when the Shedra is on vacation and the locals are away on business. The program is intended for the people living in the vicinity of DKCLI, so that they will be able to understand Buddhist views and ways, know how to practise Dharma in one’s life, and be able guide offspring in accordance with Buddhist values, without necessarily having to study major Buddhist treatises. As requested, the first talk on ‘Introduction to Buddhism’ will be bestowed by Kyabje Dungsey Avikrita Vajra Rinpoche on the 19th August of 2018.